Once a year, candidates for UTSU elections come out with lofty ideas for their platforms — most of which look great on paper. 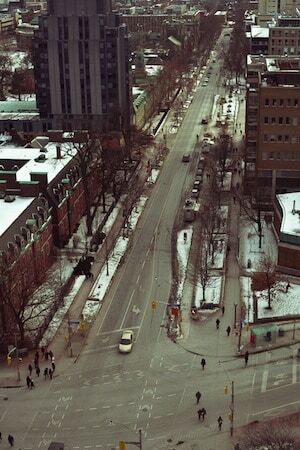 Indeed, we are all too familiar with the usual calls to close off and pedestrianize St. George Street. As it seems, however, U of T’s administration has not been approached with a proposal from the union. This presents the usual lack of commitment on the part of the UTSU. A disturbing lack of creativity and innovation and the degree to which the UTSU is out of touch with the needs of the student population. As many have pointed out, closing down St. George street would have ramifications elsewhere. As such, the chances of this proposal reaching City Council are slim. Admittedly, as an engineering student with classes in the Galbraith Building and the Bahen Centre for Information Technology, crossing St. George several times a day can be a hassle. Nevertheless, closing the street off from traffic cannot be the only solution. The problem calls for innovative solutions that will ensure pedestrian safety, but not disrupt the current flow of traffic through downtown. One of the key problems students face is not being able to cross safely at spots other than the handful of traffic signals along the street. I am no urban planner, but one idea that comes to mind is having pedestrian-activated flashing lights that would allow for a free flow of traffic. It seems that the difficulty of crossing usually arises on the hour when there is a high volume of students changing classes. Increasing the amount of time allocated for pedestrian crossing on the hour at traffic signals might be another idea to consider. A number of cities already use these approaches and they seem to work fairly well. Perhaps the biggest threat to pedestrian safety on St. George is the high number of cars that often travel well above the speed limit with an absolute disregard for pedestrians. This calls for stricter speed regulations through signage and traffic cameras. High speed has a drastic effect on a vehicle’s stopping distance and this needs to be curbed for pedestrian safety. We are all part of this city and university and ensuring we have safe, walkable neighbourhoods and campuses is vital and essential to promoting a healthy and sustainable lifestyle. Creating these conditions, however, is a challenging task, and simply banning cars is not the solution. The reality today is that vehicles are an essential part of our lives. The revitalization of St. George in 1997 won critical acclaim and did a great job of bringing back the tree canopy and attempting to restore the balance between cars and pedestrians. That, however, was 17 years ago and there is urgent need once again to think about improving pedestrian safety, not only for St. George street, but for the campus as a whole. Being in a city like Toronto, we are fortunate to have innovative bureaucrats (yes, they do exist) like Jennifer Keesmaat, Chief Planner of the City of Toronto, world-class planning consultants, and researchers at universities that specialize in this area. It is time for the UTSU to move beyond the usual rhetoric of impractical ideas, leverage these resources, and engage in thinking about solutions that will truly benefit students. Anamjit S Sivia is a second-year student studying electrical engineering.